This is my 2nd article in a series about property taxes in Jersey City. The 1st article, “Jersey City Rising,” is available here. The General tax rate in Jersey City has increased 67% over the past seventeen years, from 4.46 in 1998 to 7.43 in 2014. Over this time period, there has been no City-wide revaluation, so this rate increase has caused residents’ property tax bills to increase, particularly between 2005 and 2013 when the rate rose by 62%. A fundamental question that emerges is: why are tax rates rising? To answer this question, we first have to revisit the mechanics of the property tax rate formula. The General tax rate formula is, on the face of it, fairly simple: divide the total tax budget (specifically “the Levy,” which is the largest component of, and a fair proxy of, the budget) by the ratable base. The total tax budget can simply be thought of as “the cost of City services to residents,” including fire, police, sewer, libraries, schools, parks and roads, etc. Three government bodies spend city taxpayer money: the City, the Board of Education (which oversees the public schools), and the County. As I explained in my previous Tax Bites post, Jersey City is growing; more buildings, more people, more public school students. As the city grows, so too does the demand for resident services. There is a need for more police officers, firefighters, school teachers, classroom capacity, and perhaps improved county roads and parks. All of this growth requires one common factor: more money. As the need for more money increases, the numerator in our tax rate formula increases. Total city spending (the Total Tax Budget) goes up. But what about the denominator? The denominator is called “the Ratable Base.” It’s also referred to as “ratables,” and it represents the homes and businesses in Jersey City that are subject to property tax. It’s important to point out here that there is a lot of property in Jersey City that is not taxed. Tax-exempt property is codified in state law, and includes charities, schools, cemeteries, public roads, public buildings like City Hall, and so on. Abatements are also exempted, but they are a special type of exemption because, while they are exempt from paying property tax, they must still pay PILOTs, or “payments in lieue of taxes,” which are, like taxes, a way of funding the City budget. I’ll cover exempt property in greater detail in my next post but for now, let’s just focus on what is taxed. Taxable property should, logically speaking, be increasing along with City spending. There are, after all, more buildings, more people to live in those buildings, and thus more people to pay property taxes. But herein lies the cause of Jersey City’s rising tax rates: state tax data reveals that the ratable base is not growing as fast as the City Budget. From 1998 to 2014, the total tax budget grew by 91%, which includes 45% inflation. Over this same time period, however, the ratable base only grew by 15%. Essentially, the budget is growing and it needs to be funded; but if the ratable base isn’t growing in tandem with the budget, then the City must extract more money from existing taxpayers to cover its costs. It does this by raising the tax rate. What Can 2014 Tell Us? If we look at 2014, we can glean insight into how the numbers change from one year to the next, which in turn informs us about how much control our City leadership possesses, or is willing to exert, over this growing problem. 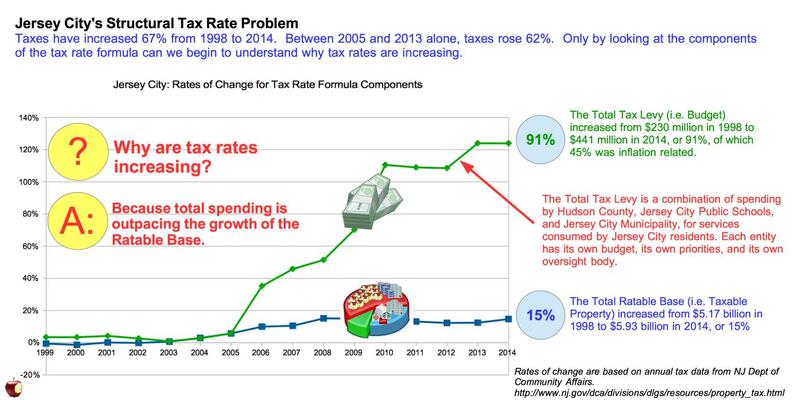 In 2014, which was Mayor Fulop’s first full tax year in office, the General tax rate decreased by about 0.42%. This is good – at least it didn’t increase again – but it’s not the 2.1% reduction in property taxes that Mr. Fulop promised in this March 2014 press release. The Municipal tax rate was reduced in 2014 by 2%, from 3.846 to 3.769. This is the budget that Mayor Fulop and City Council have control over. The Public School rate was also reduced, by 1.27%. This is the budget that the Board of Education (BOE) controls. It also is the budget that funds the teachers’ contract, which has been the subject of a stalemate between the BOE and the teachers’ Union for over a year. The County rate increased by 4.28%. This increase washed away most of the benefit of the Municipal and Public School tax decreases. The reason cited for the County uptick: Jersey City is wealthier compared to the rest of Hudson County, therefore it needs to pay for a greater share of County services. Our tax rate formula NUMERATOR: City spending, or the the total tax budget, increased, from $434 million in 2013 to $441 million in 2014. Our tax rate DENOMINATOR: the ratable base increased by $118 million, from $5.814 billion to $5.932 billion, which represented about 2% of growth. Because the 2% growth of the Ratable base outpaced the 1.6% growth of the Total Tax Budget, the tax rate went down. Getting tax rates under control is, on its face, a simple mathematical problem: either the City needs to flatline or decrease spending, or it must grow or at least maintain the ratable base. There is obviously a lot rolled up behind this math; taxpayer expectations, political agendas, and special interest groups just to name a few. But the math is clear, and it serves as a useful foundation on which to discuss the competing priorities that exist throughout the City. I’ll take a closer look at the the Ratable Base, and what is impacting its rate of growth. Data for this post will be available shortly on the Code for Jersey City (formerly known as Open JC) open data portal. Please stay tuned to Civic Parent on Facebook and/or Twitter for updates. This post was modified on Feb 18th to provide relevant context about rates of inflation from 1998-2014. Inflation-related data can be found here: http://www.bls.gov/cpi/cpid1410.pdf, page 74. Cogent and lucent! Great analysis! Don’t PILOTs reduce the numerator in the tax calculation? Since “Amount to be raised by Taxes” = (Total Appropriations minus Total Revenue) and PILOTs show up in the Total Revenue term? PILOTs contribute to the numerator, just like “amount to be raised by taxes” contributes to the numerator. Both of these revenue streams are paid by residents and businesses that consume city services. They are two forms of payment to the city for services like fire, police, schools, etc. – If I live in an abated building, I pay a PILOT. – If I live in a non-abated building, I pay a conventional tax. – PILOTs are fixed over time. The PILOT payment to the city – the revenue stream – does not change (outside of what is stated in the contract upfront), because abatements are contracts negotiated between the city and the developer before the building is even constructed. – But property taxes are not fixed; the Council can raise taxes if they need to raise more money. – Therefore: if the abated buildings are more expensive than was originally estimated (e.g. if the abatement assumed 1 child from the building would attend public school, but in fact 10 children from the building attend public school), then that building is now costing the city money (a net negative), and other revenue streams (e.g. property taxes) must go up to cover the shortfall. This is what’s happening in Jersey City. The Council has had to raise taxes to cover increasing expenses. I hope this makes sense. Let me know if not. Thank you for your comment. From 1997-2006 Jersey City’s schools would sometimes gain tens of millions of dollars a year in state aid. For instance, from 2000-2001 to 2001-2002 JC’s education aid rose from $272 million to $301.5 million. From 2001-2002 to 2002-2003 JC’s aid again rose another $10 million and the year after that another $20 million. The last eight figure increase was from 2005-06 to 2006-07, when Jersey City gained $10 million. This was not affordable for the rest of the state. From 2006-2007 to 2007-2008 Jersey City thus lost $2 million in state aid and has had its K-12 aid hover around $417-420 million ever since. For some districts this should be seen as a stagnation because they really do need more money, sometimes acutely. In the case of Jersey City this flat funding should be seen as a “plateauing” because Jersey City is becoming wealthier, meriting less aid, and the system is working as it should and not giving a town with growing wealth additional state aid. Jersey City’s student population may grow in the future, but it has been flat for the last few years. After 2008 SFRA was passed, which ended the Abbott districts’ privileges for K-12 aid. For the last few years SFRA has not been applied, but if it were applied Jersey City would not gain any aid. SFRA is very tricky, but Jersey City would not gain Equalization Aid even if its student population grew considerably. Increasing taxes are bad of course, but they are partly due to the _plateauing_ of state aid and that plateauing is a response to Jersey City’s better economic position. PS Information on historical state aid is at the State Aid Summaries.